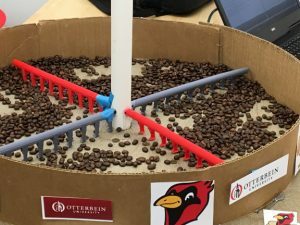 Crimson Cup recently partnered with Otterbein University’s Harpster Engineering Lab in a competition to design a mechanical coffee parchment raking system. 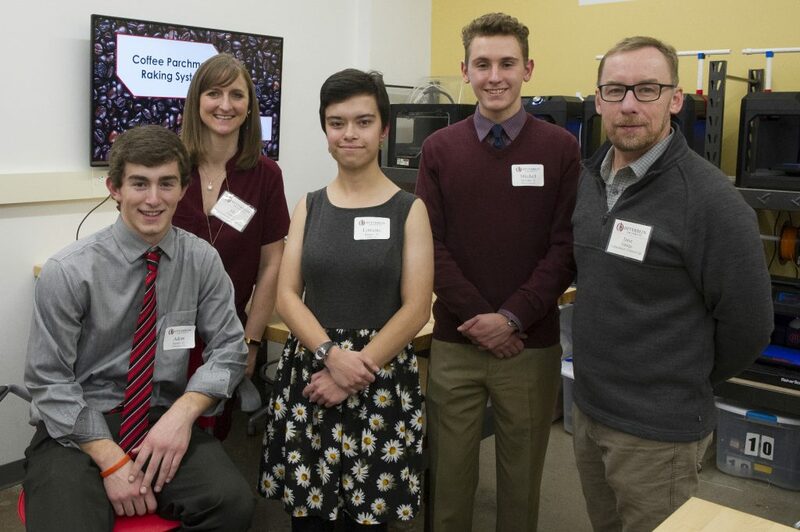 Twelve teams of students competed in the contest. Members of the winning team included Lorraine Burger, Mitchell McClain and Adam Stotler (pictured above with Dave Eldridge, right). Dave noted that coffee is an incredibly labor-intensive crop. Coffee trees produce cherries, which workers pick by hand. A de-pulping process separates the outer fruit from the seeds that are the actual coffee beans. After de-pulping, however, a heavy layer of mucilage still surrounds the beans. The wet process of preparing coffee requires steeping the de-pulped coffee beans in large cisterns filled with water to allow the mucilage to ferment off the bean. Once fermentation is complete, a layer of parchment still surrounds the coffee beans, which must be dried before this parchment can be removed. In patio drying, workers spread coffee beans in parchment on concrete patios to dry in the sun. Using a raised drying bed offers more control and consistency. However, both methods require workers to rake or turn the beans by hand to ensure even drying and prevent mildew. 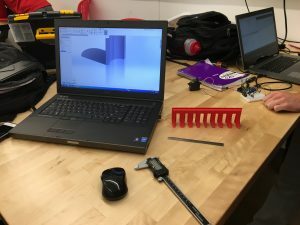 “We challenged students to come up with a machine that would reduce labor requirements while improving the efficiency of parchment drying process,” Dave said. 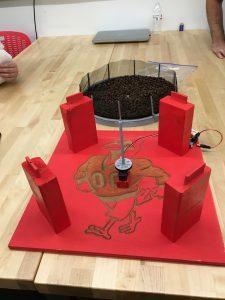 “They were judged on drying efficiency and consistency as well as power consumption, since electrical power is often not available on remote coffee farms.” Students used 9-volt batteries as a power source so that the equipment could run on simple solar panels in the field. Crimson Cup works with numerous small-plot coffee farmers through our Friend2Farmer direct trade program. An ongoing goal is to help farmers improve coffee quality and consistency so they are able to receive a better price for their product.